How much code can you learn in 10 days? This is a zero-to-hero program, where our students join us with little to no previous experience in coding. Our immersive retreat model means that you learn really fast and build tangible skills quickly. Thinking of attending the course? This is what you can expect to learn in only 10 days. These are the topics we'll cover over the 10 days. The language that creates structure in a website by adding paragraphs, headings, links, images and more. CSS is the language that adds style to your website. It controls the colors, fonts, layout and design of your site. We'll learn the basics of jQuery to add interactivity to our site (like sliders, pop-outs, galleries and hamburger menus). With the static site generator Jekyll you'll be able to build a blazing fast and very stable blog or portfolio website. Smooth scrolling, fading in and out. These are the little touches that make a big impact. Flexbox is the latest CSS layout property that enables you to build stunning designs quickly. We'll look at how to to optimise your site so that it shows up in search results on Google or Yahoo. How do you get your website to load quickly? Optimise images? Make sure it looks good across all browsers? You've built your site, now you need to get it online. We provide 12 months hosting so that you can hit the ground running. If you have a custom domain name (like www.myname.com), we'll show you how to connect it to your website. Learn from mentors who are actively working in the industry what the common best practices are. We'll review everything you learned in the pre-coursework and hit the ground running building a landing page from scratch. We'll learn how to add custom fonts with google fonts, how to add icons, begin to create layouts with structural HTML, and how to style your page with CSS. We'll learn the CSS box model, flexbox and positioning so that we can create custom layouts and grids on our site and position our content exactly the way we want. We'll also spend the afternoon building our first portfolio site — a personal resume site. It's time to start building our portfolios, so we'll learn the process for building a project from scratch and start coding our sites. We'll learn how to fast-track development by using a grid framework. You're mentors will be checking in regularly to help you solve any bugs, overcome any hurdles and keep you moving forward quickly. We'll learn how to create blazingly fast blogs and custom build sites using the static site generator Jekyll (link to article on static site generators) and how to integrate our sites into a content management system so that non-technical users can easily edit and update their sites. Your portfolio pieces will be really starting to come together now! We'll learn how to optimise your site for search engines like google (SEO), how to boost performance (ie by optimising your images) and make your site look great on all browsers. Then you'll learn how to upload your site to a hosting provider and connect your unique domain name. 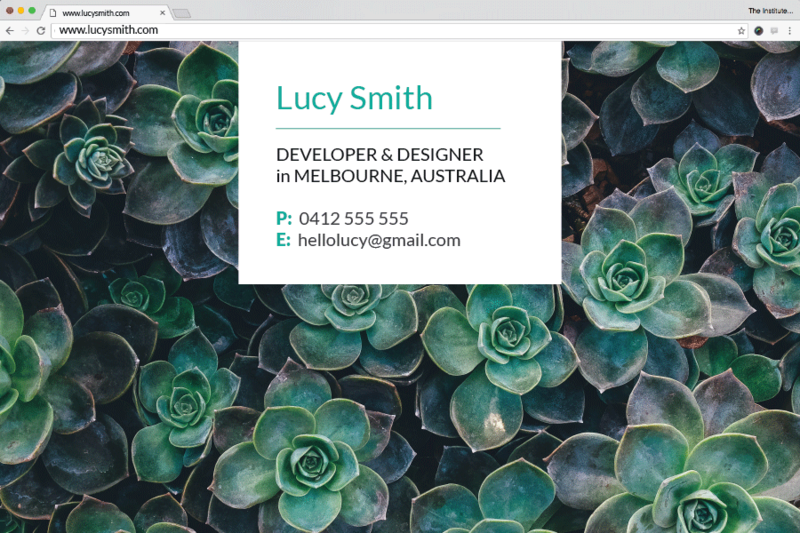 Sam built this responsive site for her new company Well Traveled. Ben built this portfolio website to showcase our Co-Founder Emile's photography during his session in November. Bronte built this site for an amazing non-profit in California called dream camps. Ready to learn for yourself?